There are few characters in gaming who are quite as cute as Kirby. He’s no Mario or Link, but he’s still one of Nintendo’s most popular characters. Those two things, along with his shape, made him a good fit for a game that showed off the DS’s touch screen. 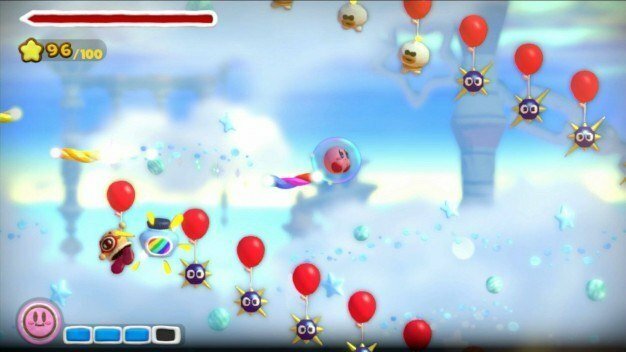 Kirby’s Canvas Curse was quite fun for what could have basically been a tech demo, and it was popular enough to warrant a sequel…10 years later. Much like the Kirby’s Dreamland series, it also jumped from a portable to a home console. Welcome to Kirby and the Rainbow Curse. Rainbow Curse plays much like its predecessor. 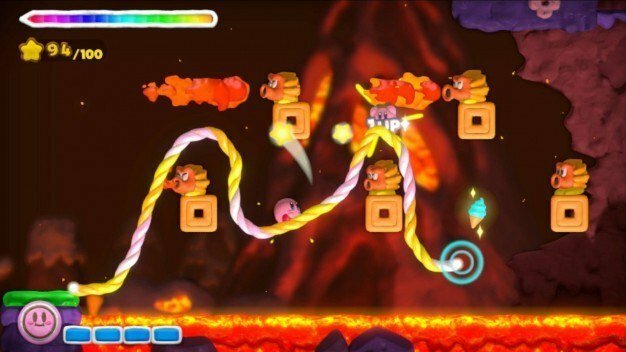 On the Gamepad touchscreen, players draw a rainbow path for Kirby to follow. The only direct control the player has over Kirby is tapping him to make him dash; other than that, you just draw paths. 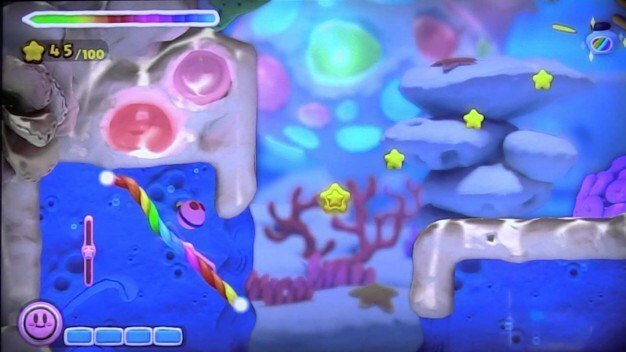 The game is presented in a typically colorful Kirby style, with one interesting twist: everything appears to be made of clay. Throughout the clay landscape, Kirby and his new friend Elline must try to return the color to Kirby’s world. The game is much more fun than it might seem at first glance. The presence of stars, which charge up Kirby’s super boost, means there can be a lot more variety to what you draw. You can also use lines to block certain environmental hazards, though it can get a bit confusing when you have to do both. There are puzzles to solve if you want to collect the chests as well, so you need to think fast. Things get finicky when there’s a lot happening on screen, but the biggest issue is that you have limited “ink” with which to draw your rainbow lines. It adds to the challenge, but it often hurts the game more than it helps. Few things are more frustrating in a game than having to wait for something to charge up, especially when you can’t do anything until it does. There are pickups to refill the “ink,” but I still wish they weren’t necessary. Overall though, the key gameplay works quite well. Rainbow Curse also adds multiplayer to the mix, which is always welcome. 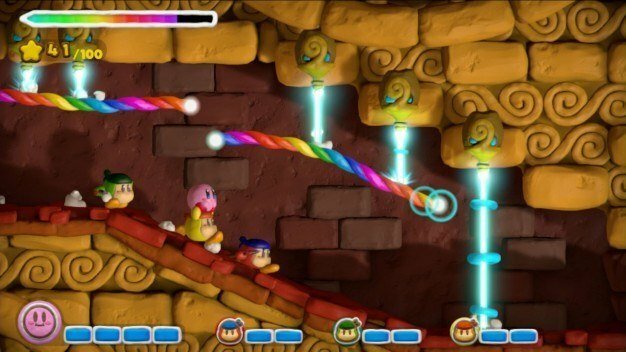 Two other players can control Waddle Dees wielding spears, which has become a staple of the Kirby games since Return to Dreamland. Using Wii Remotes turned sideways, the Waddle Dees are controlled in a more traditional manner. This creates a bit of a problem, though. Sometimes Kirby is useless, because the normally controlled Waddle Dees can take care of things much quicker. Other times, an area is specifically designed for the line following mechanic, and the Waddle Dees can’t do a thing. The multiplayer is definitely tacked on, but it’s still fun. If you don’t mind that things will be a bit too easy, it’s fine. Needless to say, it’s the graphical style that really makes this game stand out. The designers have done an excellent job of making everything look like clay, complete with slight imperfections for realism. I’d almost believe it was stop-motion honestly. Every single part of the game is in this style, and much of the animation plays into the style as well. For example, if a cannon shoots Kirby into a wall, he’ll flatten and drift down to the ground. The only real issue here is that you will spend most of the game looking at the small Gamepad screen. It’s very hard to draw on the screen you aren’t watching, so you won’t always appreciate the graphics until you get a chance to look up. The last thing to note is the music. This game has an excellent score. With a mix of classic Kirby tunes redone and several new songs, it really impressed me. 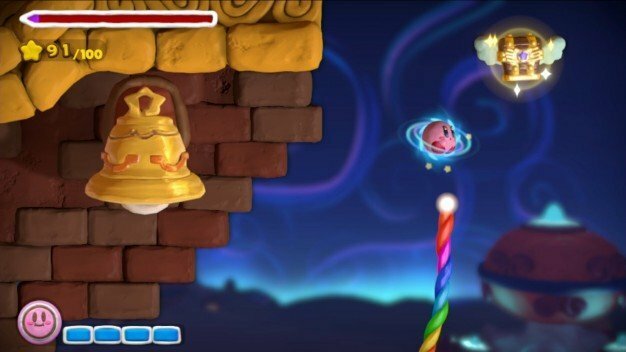 Treasure Chests collected throughout gameplay unlock trophies and musical selections from throughout the entire Kirby series. Once unlocked, you can visit Sound Test, a music-only mode where you can enjoy the tracks in peace. It’s definitely worth a listen. Despite some frustrations, Kirby and the Rainbow Curse is a solid game. The charm and core gameplay make up for any issues, and the soundtrack makes it even better. Though the game won’t last too long, there is some replay value in finding the hidden chests, along with the challenge mode. 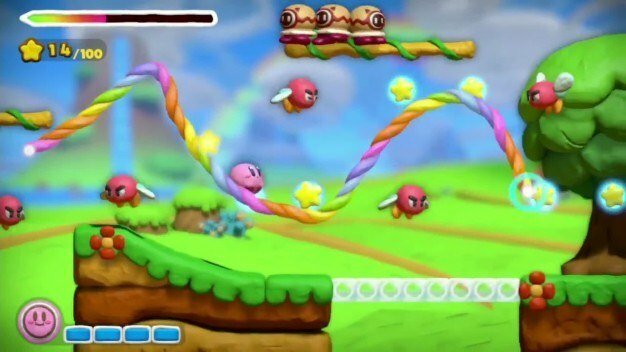 It’s pretty much what you’d expect from a Kirby game, and it works quite well in this package. It probably won’t win any awards, but that won’t stop Kirby’s smile.